Beach cruisers are often described as one of the most enjoyable rides out there. 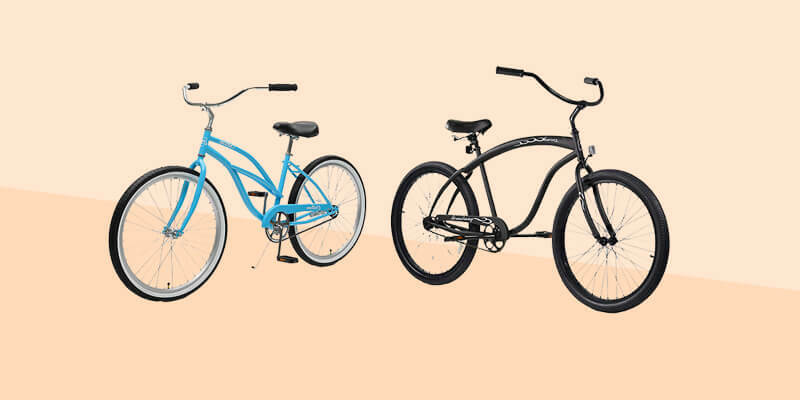 As the name may suggest, they’re designed for sandy beaches – and if you’re imagining yourself on a pastel coloured beach cruiser riding along the pier on a summer’s day, then you’re on the right track. These bikes are usually minimalist, lightweight and hassle free. 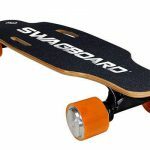 They’re popular among vacationers, but also can easily be used as your daily commuter or your trip to the shops. However, these days beach cruisers are being designed with a lot of variation from the original concept, so there are plenty to choose from. We’ve compiled a list of the best beach cruisers that vary from simple single-speeds to multifunctional cruisers which can also go off road and take you on an exhilarating journey. What is a Beach Cruiser? 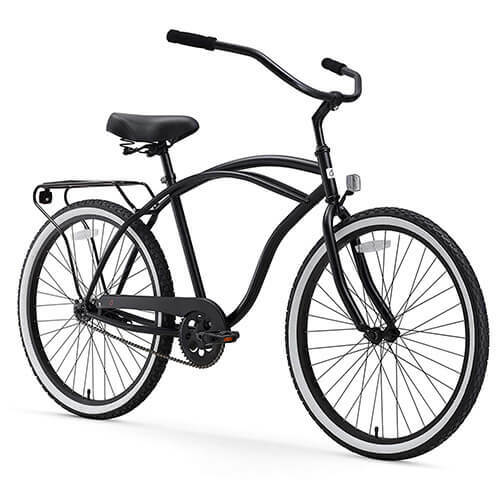 Beach cruiser bikes are based around the simplicity of the ride, and ideally your bike would be light but strong. The desired beach cruiser frame will be light enough that it’s unobtrusive and easy to ride, however strong enough to carry any rider and combat getting thrown around every once in a while. 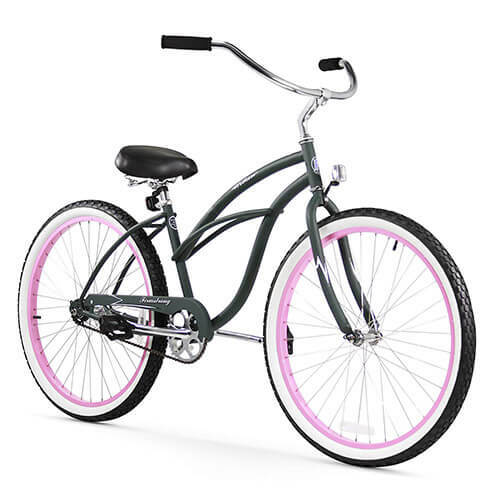 Historically beach cruisers have been made out of steel, and this provides a strong, heavier bike that outputs a stable and comfortable ride. This is often how beach cruisers are made today, however more and more beach cruiser frames are being built out of aluminium, a lightweight alternative to steel frames. Due to the combination of ‘light but strong’ being in-demand and a more costly production process, these bikes are at the more expensive end of the spectrum. Therefore a more affordable bike will end up being heavier, yet also strong! 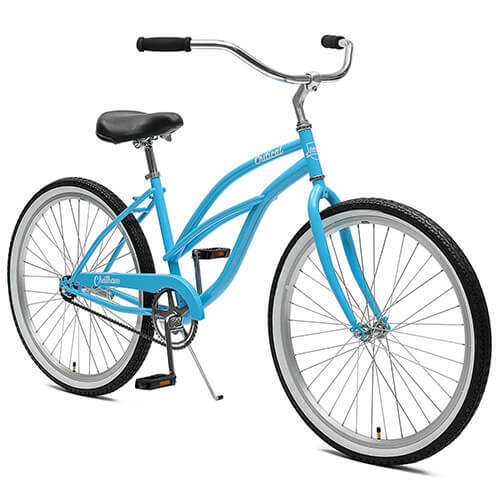 Beach cruisers have noticeably wide tires, these are sometimes called ‘balloon tires’ and have a number of positives. These first and foremost prevent any struggles when riding on sandy beaches, as they stop you from sinking into the sand, give you more stability and mean you exert less energy resulting in a leisurely ride. They also receive less punctures as the tires are thicker, and generally produce a more stable ride across multiple terrains. The handlebars on a cruise bike are forward placed, unlike other bikes which will often be perpendicular to the rider, they’re also considerably wider. These wide, forward placed handlebars allow for the rider to sit in a comfortable upright position, resulting in a more relaxed, enjoyable ride which focuses on good back positioning and posture. Beach cruisers often find no need for gears as the bikes are designed for simple, relaxed rides rather than races or uphill journeys. However in the recent years beach cruisers have been produced with gears incorporated, as there has been a rise in demand for beach cruisers that can be multifunctional and complete tasks such as off-road journeys or rides up steep hills. Along with a lack of gears, the majority of beach cruisers were originally built without brake handles. Instead they use back-peddling, called a ‘coaster brake’. Many manufacturers and customers say this adds to the simplicity of the ride. This could take some getting used to but it’s often pointed out how easy this is. However, once again there has been a rise in demand for handbrakes, as they output a more controlled, precise stop and many people claim this is safer than a coaster brake. So beach cruisers today usually have the option of adding one or two handbrakes. 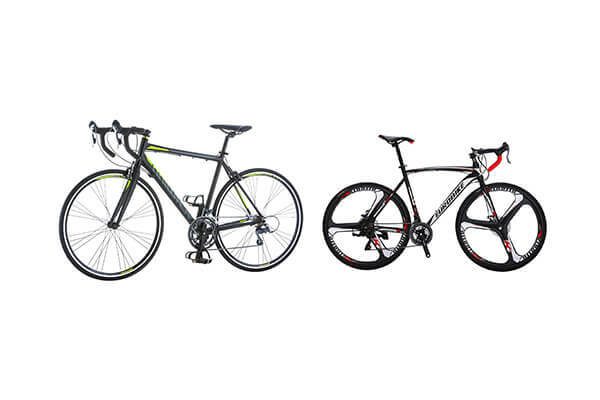 Ultimately, men’s and women’s cruisers are built for the same task and comprise of the same features and components. However, there are small differences in their designs that you will notice if you look at them side by side. A massive difference is the height range. To accommodate for the average male and female height, men’s cruisers will usually target taller people than women’s cruisers. A man’s cruiser will usually start at around 5’4” to 5’7”, and end at 6’2” to 6’4”, whereas women’s cruiser’s will have a minimum of 5’0” to 5’4” and a maximum height of around 6’0”. Another difference is the aesthetic, a lot of men’s cruisers are available in chunkier, beefier designs than their female counterpart. Compared to men’s cruisers, women’s cruisers have slimmer tubing and have larger curvature in the top tubing. 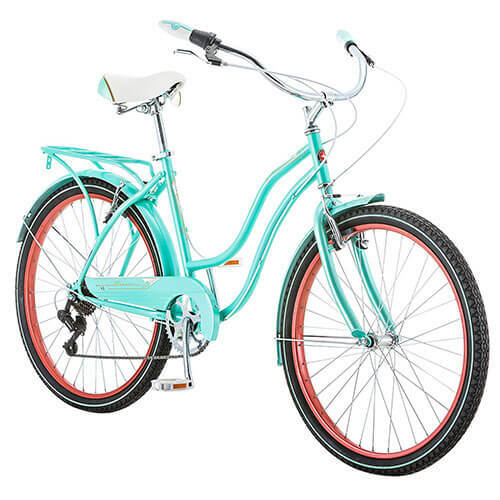 The Firmstrong Urban Lady is a classic beach cruiser with a few modern twists. 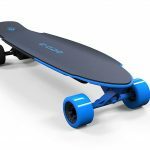 It can be purchased with up to seven gears, therefore is better for anyone who wants to reach faster top speeds and climb hills with relative ease. It also has front and rear hand brakes, a divergence from the standard backpedaling brake. However hand brakes gives you more control over your stopping power, this is better for anyone who will be using their beach cruiser for commutes. Aside from this however it has a retro beach cruiser design, with a curvy steel frame and aluminium wheels. The seat is oversized with dual springs for suspension and added comfort, and the handlebars are wide with rubber grips. 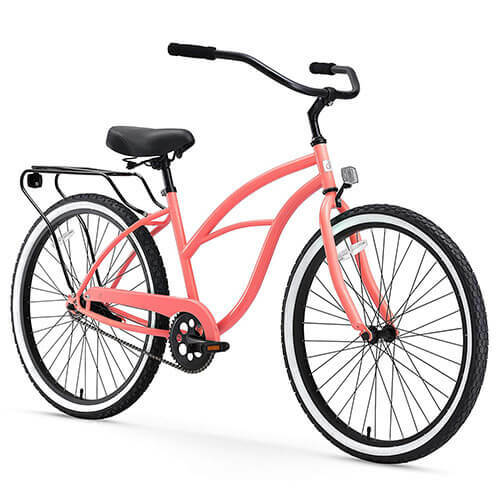 This bike is available with either a 24” or a 26” frame, meaning it is suitable for women from 5 to 6 feet tall, and can hold a weight of up to 300 lbs. If gears aren’t your thing, the Urban Lady is available as a single speed, three speed or seven speed. You can get this bike in multiple different colours, with Firmstrong releasing sixteen different versions! Our next bike comes from the reputable company Sixthreezero. This is a stylish and affordable beach cruiser coming in six different colours and your choice of brown, black or white seat and grips. 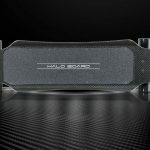 They’ve covered their bases with a chain guard to protect clothing from potentially getting damaged, and a rear rack for baskets or other accessories. The retro curvy frame is made of steel, and the 26” aluminium wheels come with large waffle tread tires for extra comfort and control. Sixthreezero have also kitted it out with high-density foam grips and a dual-spring seat for added comfort, along with an adjustable handlebar height to maintain good posture. The Around the Block bike comes in four different gear options, ranging from a leisurely single-speed bike to an impressive 21 speed bike, for those who want to tackle the steepest of hills. Sixthreezero have provided the combination of a front handbrake and rear coaster brake for bikes up to 7 gears, then they take it to both front and rear handbrakes from there. The Nel Lusso is your budget option in disguise. With a beautiful design and plenty of fun features to play around with, you’d be silly not to consider this. Huffy have gone for simplicity here. With a lack of brakes or gears, you’ll be able to cruise around the beach on your banana-yellow bike, supported by a steel frame and sitting pretty on the padded seat. This bike is great for someone who is always on the go, as it has a front basket, a rear expandable rack, a cup holder and a smartphone slot, so you won’t fall short of anywhere to store your possessions or shopping. The wide, front-facing handlebars give you an easy ride and let you sit in an upright position, making it easier for you to enjoy the view as you cruise on the beach. The wide 26” tires are protected from spray from puddles by bright yellow fenders, and also keep you dry as you ride. Schwinn are an established company that was started in 1895 in Chicago, IL. 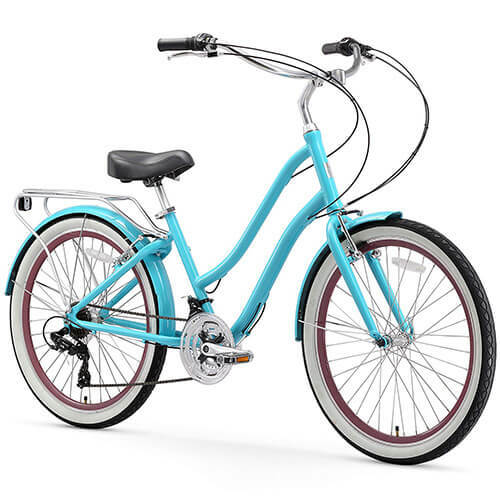 With a lot of good bikes to choose from, the Perla stood out to us because of the rave reviews it had been getting, and in the court of public opinion has got to be one of the best beach cruisers for women out there. 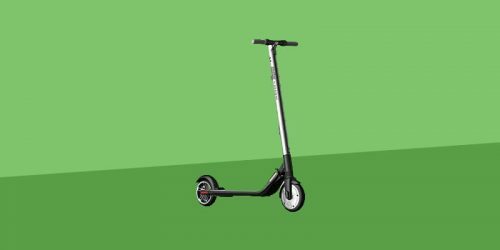 The Perla will provide you with a relaxing ride whatever the occasion, however if you want to take it to the next level, this bike has 7 speeds to choose from. The strong 18” steel frame will support you and your groceries, which can be stored on the handy rear rack. It has a quilted seat for a plush ride, which also has springs for suspension so your ride will always be as smooth as silk. 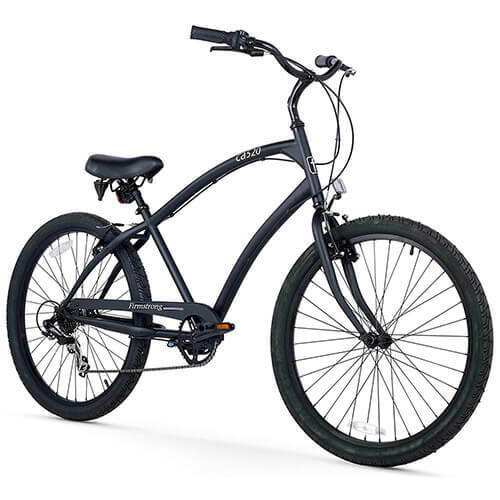 The bike provides reliable and controlled stopping with front and rear hand brakes, it has alloy rims and large, high quality 26” tires that protect against flats or damage. Additionally, the tires have an extra layer of protection with a fender on each wheel, to protect you from spray from dirt or puddles. This bike is ideal for women between 5’4” and 5’9”. A personal favourite of mine, the Critical Cycles Chatham cruiser has an aesthetic that I can’t get enough of. 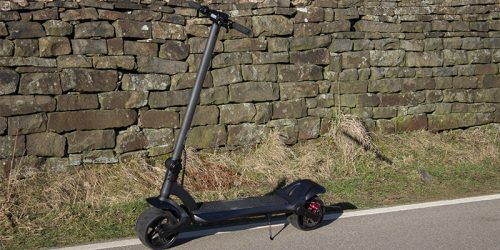 With a hand-built shock-absorbent steel frame, soft foam grips and an extra wide saddle, you’ll be turning heads as you cruise with style. The upright handlebars will alleviate any back pain, and the extra wide 26” shock absorbent Wanda Tires have been upgraded with double-wall rims, which protect the tubes in your tires and add years onto the life of your bike. This bike comes with three gear options, the single speed providing a simple, undemanding ride that has coaster brakes and minimal maintenance as you have no chains to worry about. Their bike with the highest amount of gears, the seven speed, gives you a reliable, accurate ride that can withstand multiple different terrains and get you up varying gradients. The hand brakes on the seven-speed are dependable and responsive. Coming in at 40 lbs, this bike is lightweight and can hold over 150 lbs. This is an affordable bike produced by a company passionate about what it does. Finally, if for some reason you’re not convinced by this bike, it comes in a variety of colors, my choice being the turquoise bike with gumwall tires! Our second Firmstrong on the list is the Urban Man. A strong, steel bike that comes in four different gear options and is suitable for men between 5’4” and 6’2”. 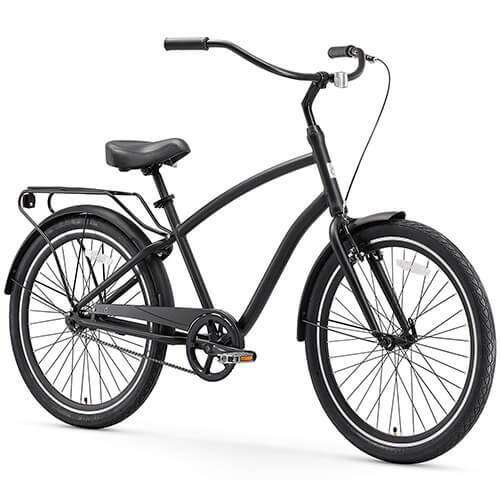 This bike has a 17” classic cruiser frame and allows you to sit in a comfortable, upright position with its wide front-facing handlebars and oversized seat with dual coil springs for comfort and suspension. It also has wide whitewall tires made of aluminium which absorb any bumps, and grips for added traction with the ground. The Firmstrong’s four different gear options are single-speed, 3-speed, 7-speed and 21-speed. While the single-speed and 3-speed have the rear coaster brake option, the 7-speed and 21-speed provide a handbrake, for a controlled and precise stop. The Urban Man is an affordable, well made bike that is made of long-lasting materials. 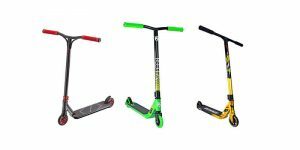 It comes in 13 classic colours, each one complimenting the cruiser in a unique way. The Around the Block men’s cruiser is a sleek bike with a simplistic and impressive design. This low maintenance bike comes in three different gear options and up to 21 speeds, and sits you on an ergonomic 19” steel frame. Your Around the Block bike will provide you with a beautiful ride while cruising on your 2” aluminium wheels with waffle-tread tires cushioning your ride. The wide foam-grip handlebars add to the fun of your ride, keeping you in a casual upright position along with the comfortable dual-spring, cushioned seat. 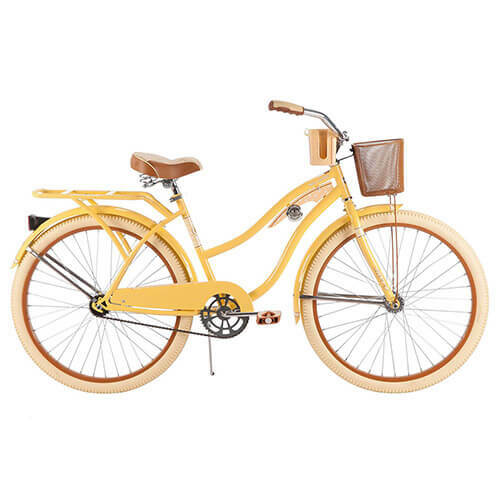 Additional features include a reflector on the front of the bike, whitewall tires and a rear rack for shopping or accessories. The single-speed bike is great for a minimalist lifestyle with casual outings, with no wires and a rear coaster brake. 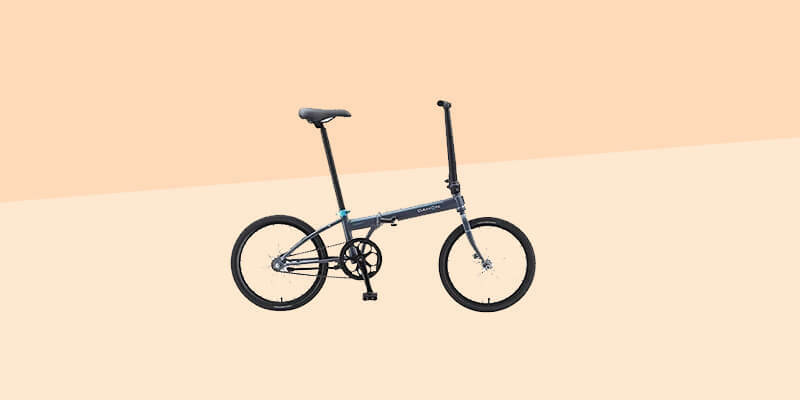 Alternatively, the 21-speed has front and rear brakes and can tackle steep hills and rough terrains, perfect for anyone looking for something you can take on exhilarating adventures. The EVRYjourney is a hybrid cruiser bike, and could be described as the best of both words in terms of city journeys and off road adventures. 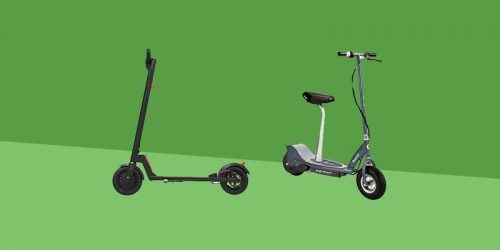 These bikes are ideal for people who want a bike that they can enjoy an upright, comfortable cruise on as well as a bike they can get more aggressive with and take off road. This bike is matte black, with a 19” aluminium frame, which means it is more lightweight than its steel counterpart. The cruiser frame combined with the front-facing wide handlebars keep you sitting in a relaxed upright position, while the strong suspension and thick, wide tires allow it to be taken onto rougher terrains. These tires are 1.95” wide with a whitewall design, and the seat has dual-springs for an extra smooth ride. The EVRYjourney has four gear options, with a range of single-speed up to 21-speeds. The single speed is ideal for flat terrains and includes a front handbrake and a rear coaster brake. The 3-speed and 7-speed come next, sporting a Shimano internal hub. This takes us to the 21-speed, with a Shimano Tourney derailleur with friction shifting for that extra smooth gear changes, ideal for trails or uphill riding. The 21-speed also has front and rear brakes. To top off the EVRYjourney, it comes with a rear rack for baskets or accessories, and colour matching fenders on both wheels. This bike comes 80% assembled, and would suit anyone from 5’ to 6’4”. 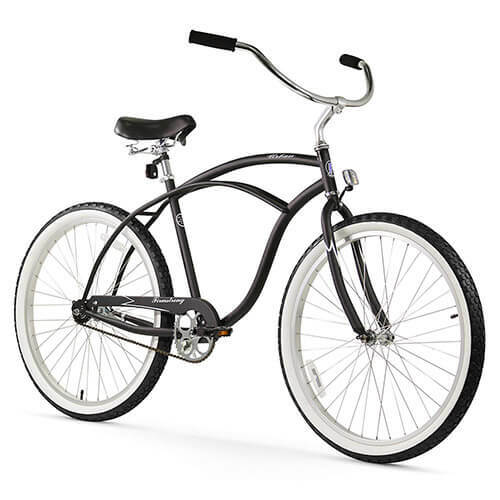 Our penultimate Firmstrong bike is the Bruiser beach cruiser bicycle. This is a more substantial beach cruiser with a thick 17” frame which gives it a beefier look, and 2.125” wide, grippy whitewall tires with 26” aluminium rims. This bike is great for the taller guy who wants more space on his bike, it has a 2” extended frame to create more distance between the rider and the handlebars. The seat as dual springs and is oversized for extra comfort, and the all-black tires create a cushioned, smooth ride as they absorb bumps in the road. The handlebars are a spacious 38.5” wide, and come with synthetic leather black grips. The seat and handlebars can be adjusted to suit you so you get a perfect ride every time. This bike has 3 different gear options and ranges from single-speed to 7-speed, with a coaster brake for the single speed and handbrakes for the geared options. This bike fits anyone from 5’4” to 6’4”, and comes 80% assembled. 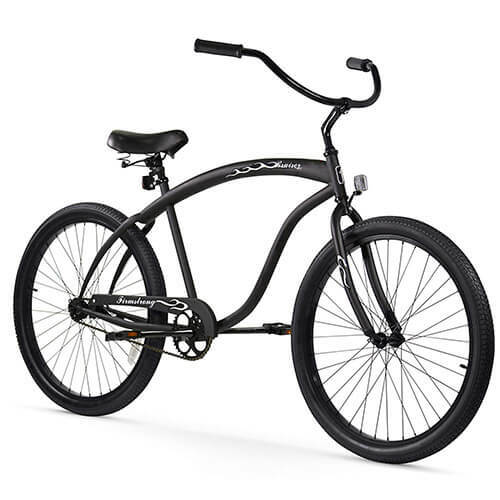 Last but not least is the Firmstrong CA-520 Alloy beach cruiser. This bike is designed for maximum comfort, with a seat that is positioned lower down than your average beach cruiser’s, and pedals that are around 4” further forward. These features not only create a much more relaxed ride, but are perfect for taller riders as the pedals being positioned further forward rather than directly below you create extra leg room. The frame is 17” with a 4” extended frame, which puts more space between you and the wide cruiser handlebars. The wide, balloon tires are 2.125”, and you can go for miles on this one, with the recommended maximum riding distance being 40 miles on a single trip! For anyone who feels like the design of these beach cruisers might not be right for you, this is your bike. The forward pedaling design and low seat are ideal for a relaxed ride with plenty of leg extension. This bike weighs 43 lbs and can hold up to 350 lbs. So you can see that there are plenty of high-quality cruisers to choose from, ultimately you need to know what you want, and make sure you pick the right design and size to suit you. 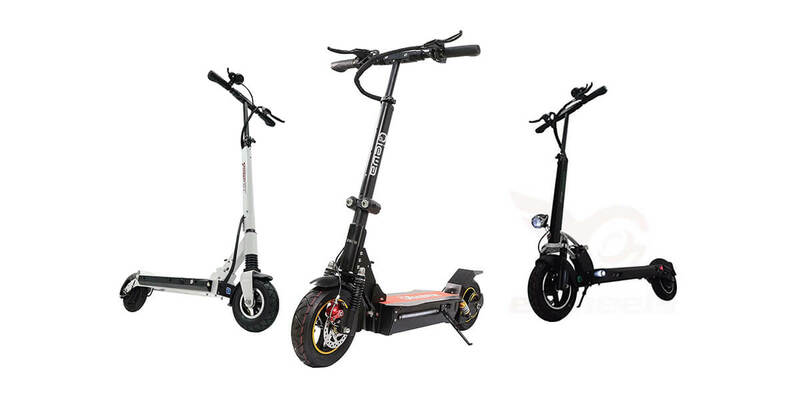 As you can see beach cruisers come in different colours, prices and are designed for varying tasks. However each one of these is streamlined towards comfort and enjoyment in the ride!